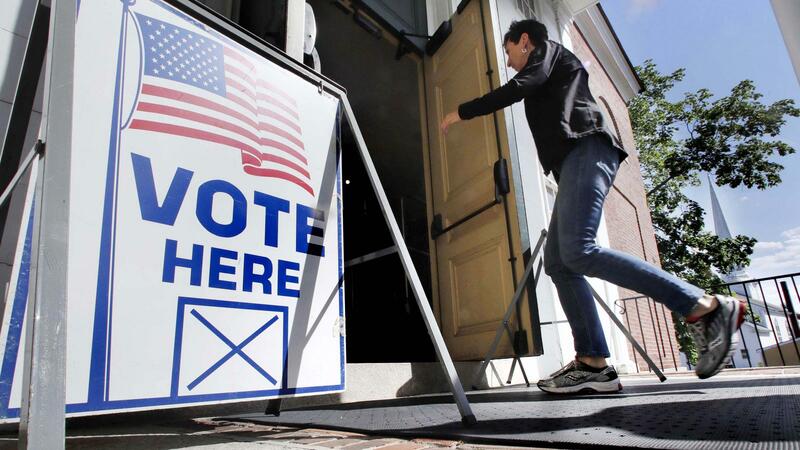 A resident walks in to cast her vote at a polling station in Maine on June 12, in the state's primary elections. Maine is one of 17 states that has yet to apply for election security money allocated this year by congress. Three months after receiving congressional approval, and now less than five months from November's midterm elections, 33 states have filed the necessary paperwork to begin receiving money. That number may seem "disconcertingly low" to some, especially when it was just 11 in mid-May, but there is mixed consensus on what it actually says about the country's seriousness when it comes to handling threats leading up to the 2018 election. "Judging a state's preparedness and dedication to securing the vote based on this measure alone is a careless oversimplification," said Thomas Hicks, the chairman of the Election Assistance Commission, which is in charge of distributing the money. He penned a letter in response to a Politico article published last month about the low number of states that had applied for the funding. "The states want the money, and we want to give the money out," Hicks told NPR in an interview. "It's mostly that they have to deal with their legislatures, and things like that. They have to jump through some hoops back at home before they can come to us. "It's not as if states are delaying in doing this — there are just steps they need to go through." But also, just because a state has applied for the money doesn't mean everything is swell. There are, after all, valid security questions for election officials across the country: from the fact that 13 states still use electronic voting machines that don't provide an auditable paper trail, to the security of local election websites that have often never seen a major test. Even if every state did prioritize its own issues, bureaucracy has slowed the process. With midterms nearing, and the intelligence community warning about impending interference from Russia, that could be a problem. Each state has a completely separate set of variables to deal with in shoring up its systems, from different attitudes about election security within their respective state governments to the disparate nature of voting methods and infrastructure across the country. "The number [of states that have applied] in the abstract doesn't worry me," said Larry Norden, a voting expert at NYU's Brennan Center who has authored a number of articles warning about outdated voting equipment in the U.S. "But there are specifics that bother me." Norden mentioned Nevada as one example; the website FiveThirtyEight recently published an article outlining vulnerabilities with parts of the state's website (though none were related to elections). In the story, Wayne Thorley, the state's deputy secretary for elections, said they had not yet fixed one issue because they work "in a resource constrained world in government." Yet Nevada has yet to apply for the $4.3 million it has been allocated. In an interview with NPR, Thorley explained that the delay in drawing down the federal funds is not by choice. To receive the money, the state needs approval from the governor's finance office, as well as the Nevada legislature, which currently isn't in session. There's a special finance committee meeting at the end of the month, where Thorley is expecting to get approval to start spending the money by July 1. The state is planning to spend the money on cyber security improvements and training as well as improving its auditing capabilities. Hicks, the chairman of the EAC, said he expects every state to have turned in the necessary 2-3 page narrative application by the end of July. The amount each state receives is based on population, and not on any metric based on that state's level of security or need. But just because a state has turned in its application, doesn't indicate election security bliss. Minnesota for instance, is one of the 33 states that has turned in the necessary paperwork to receive their portion of the money. But a disagreement between the Gov. Mark Dayton, a Democrat, and the Republican-controlled legislature over a proposed budget bill means the state won't be able to access the $6.6 million it is due until after November's elections. "There soon will be a $6.6 million account with our name on it," Minnesota Secretary of State Steve Simon told NPR. "Earmarked for precisely the purpose we need: election security. And we can't touch it." Simon said his office was hoping to use a portion of the money, about $1.5 million, to hire coders for the next four years to modernize and secure the state's voter registration system, which was built in 2004. He says he "testified before legislators six different times, made numerous phone calls, and held countless in-person meetings with legislators and staff" to try to convince them to separate approval for use of the election security funds, from the larger budget bill, knowing that Dayton had issues with other aspects of the bill. He compared attaching approval for use of the funds, to attaching the money to the Titanic. "It hit an iceberg and did not come to pass," Simon said. "It ended up a bad result, and the worst part is, a totally avoidable result." Simon, and voting officials nationwide, know ensuring voter confidence is a key task of election officials. Despite the setback on getting funding, Simon remains confident Minnesota's elections will be secure in November. The intelligence community says despite Russian hackers targeting voter registration systems in a number of states, there's no evidence any votes were changed. California, the state set to receive the largest chunk of federal money, also has yet to apply for its share. But California Secretary of State Alex Padilla says the state was busy preparing for its June 5 primary, and he wanted to wait until afterward to release its plan for the money. The exact spending details are still being finalized, but Padilla expects the state to spend about $20 million of its $34.5 million on equipment improvements. While the money is welcome for election officials, Padilla said it's also important to put the amount in perspective. It won't be a silver bullet. His state alone received more money as part of 2002's Help America Vote Act, than the entire country is receiving this year from Congress. "It will put more of a dink than a dent" in the broader effort to improve election security nationwide, he said.